STAGE PRESENTS: celebrating our creative gifts! Keynote Biography: Outside Joke is a Winnipeg-based improvisational theatre company. 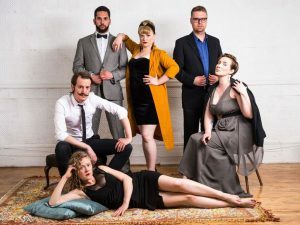 Since forming in 2002, they have performed in festivals and theatres across Canada, including Vancouver, Edmonton, Calgary, Regina, Saskatoon, Winnipeg, Toronto, and Montreal. Creating a brand new improvised musical every time they take the stage, Outside Joke brings a playful energy and an open heart to their craft. Outside Joke is Andrea del Campo, Paul De Gurse, Chadd Henderson, Toby Hughes, Robyn Slade and Jane Testar. Session Description: In this workshop, Andrea and Paul will guide the group through an accessible and fun way to improvise songs. No singing or improv experience required! Just bring an open heart and a willingness to laugh at and learn from your own mistakes. It’s impossible not to have fun when you are making up songs! Presenter Bios: In addition to their work with Outside Joke, Andrea Del Campo and Paul DeGurse are also professional musical theatre artists; Andrea as an actor and singer, and Paul as a musical director and keyboardist. They are able to blend their experience in scripted musical theatre with their skills as improvisers to create and teach a truly unique brand of improvisational theatre. Session Description: Two Thousand, three hundred and thirty four Manitoba students participated in a pan-Canadian study and reported how often they were involved in artistic and technology-related activities during and outside of school. They identified their favourite arts activity, described the learning environment, and revealed benefits they derive from engaging in the arts. Come, learn from student voices! Presenter Bio: Dr. Francine Morin is Professor (Arts Education) and Associate Dean Undergraduate Programs at the Faculty of Education, University of Manitoba. She teaches, conducts research, and serves the professional community in a variety of ways. She led the Manitoba component of a pan-Canadian study of arts learning and youth engagement in the digital age and studies the impact of an after-school orchestra program on children’s development. Dr. Morin is Chair of Manitoba Education and Training’s K-12 Arts Education Steering Committee and Provincial Evaluation Committee and on the Advisory Board for the Canadian Network for Arts and Learning. Session Description: This workshop will cover intermediate filmmaking techniques including script writing, using camera movement, colour, sync sound, focus and colour keying. Participants will produce a short 30 second commercial using the techniques mentioned above. Bring a laptop or USB drive if you would like to take copies of the files with you. Presenter Bio: James McLellan is a local filmmaker and teacher at Oak Park High School (www.youtube.com/oarkpartkhighschool) His last short film, “Period Piece” (https:vimeo.com/98302382) played at over 25 film festivals and won the top short film prize at the Gimli Film Festival and the Toronto After Dark Horror Film Festival. Session Description: CORPOREAL MIME is Geometry of physical movement, articulation and triple design. PANTOMIME is external manipulation of space and time creating illusion. CHARACTER MIME is the laboratory of the internal and external, with/without sound. Focus will be on principal ideas of each; essential components/exercises of each, demonstrations of each and levels of participation/engagement in each. These workshops have been taught to elementary to senior students (only the level of language changes). Participation is strongly recommended. NOTE: many exercises may be adapted to chair work. There will be time for questions. Presenter Bio: Larry Swanson B.A., B.Ed., M.A. (Corporeal Theatre), L’Ecole Mime Decroux, 40 Below, Theatre l’ange Fou, Oak Park High School, University of WInnipeg. Presently Director of Atu Ka (theory, research, laboratory) Mime – Corporeal Theatre, located in the Exchange. Session Description: In this workshop we will be exploring the use of projection in modern day theatre. We will look at the different type of projectors, software, and how to create and playback your content properly. Session Description: In this workshop, we will cover the basics of fighting, including the most common styles of combat found in plays, and learn how to make them appear real in an effective and safe manner. We will touch on the importance of intent and how to bring an actor’s mind to a fight. We will also go over body limits, and how to modify choreography to fit individual student’s needs. Presenter Bio: Rachel Hiebert graduated from the University of Winnipeg with a Bachelor of Arts in Theatre Performance with Honours. During her time there, she spend three years learning stage combat from RIck Skene. She has since attended two INternationals Stage Combat summits in Banff, Alberta and trained in swordplay in New York. Description Session: Quality, equitable assessment of K-8 drama learning requires intentionally targeting drama curriculum outcomes for formative and summative assessment. In this session, explore ways to target and cluster drama learning outcomes for different assessment purposes. Examine characteristics of quality assessment and ways to develop and co-construct assessment criteria, including both process and product. Tools for formative and summative assessment will be provided, along with assessment strategies and ways to collect valid and accurate evidence of learning. Participants are encouraged to bring authentic classroom drama learning examples to this session to inspire ways to plan for assessment of learning. Presenter Bio: Dr Peters has taught arts education in schools and universities from Texas to the Yukon. She minored in Theatre (B. Mus( and holds a Ph.D. in Inclusive Special Education. Beryl’s Ph.D. research (University of Manitoba) investigated links between music and reading and was the winner of the National 2012 Arts Researchers and Teachers Society Doctoral Graduate Research Award. Beryl is a recipient of the Morna-June Morrow Award for Excellence in Music Education and the Students’ Teacher Recognition Award for Teaching Excellence at the University of Manitoba. She is a contributing author to Robert Kelly’s latest book (2016) Creative Development: Transforming Education through Design Thinking, Innovation, and Invention. Dr. Peters is currently the K-12 Arts Education Consultant for Manitoba Education and Training. Dr Peters has been secondment by the University of Manitoba for the 2018-2019 academic year as Director, School Experiences. We are honoured to have her still make this presentation to us. Session Description: The session will open with a discussion of the value of teaching playwriting to high school students, and then concentrate on practical approaches; the unities and their value to young, inexperienced, playwrights, releasing the student’s voice, discovering ‘the idea’, characters, and the story, outlining the script, 1st draft, and methodologies for developing a short play beyond first draft. We’ll end with a free discussion to meet the curiosities and questions germane to the individuals in the group. Presenter Bio:Brian Drader is a writer, dramaturg, actor, and artistic administrator. His plays have been produced in Canada, the United States, and Europe. Awards for his writing include the Herman Voaden National Playwriting Award (1997, for THE NORBALS), the Philadelphia Brick Playhouse New Play Award, and the Lambda Literary Award for Drama (USA), as well as nominations for the Governor General’s award and the McNally Robinson Book of the Year. Published work includes THE NORBALS, PROK and LIAR (Scirocco Drama), and CURTSY and TO BE FRANK (Signature Editions). A short film, IRIS AND NATHAN, won the National Screen Institute Drama Prize. Commercial engagements include writing the audio components for Indiana Jones and the Adventure of Archaeology (with Jodi Essery) and video components for Star Wars Identities, both touring museum exhibitions (gsmprjcts/Lucas Films/National Geographic), dramaturg for Cirque du Soleil’s MJ ONE at the Mandalay Bay in Las Vegas, and dramaturgical support for the 2017 revamp of The Canadian Museum of History in Ottawa. Brian served as the Director of Playwriting at the National Theatre School of Canada in Montreal from 2004 to 2017, and is now the Executive Director for the Manitoba Association of Playwrights. Session Description: Participants in this workshop will bring a unit of their choice to share with all: we will walk through, and demonstrate with other drama teachers – sharing the unit you are most proud of – so we all have an idea of what others are doing in their programmes. This gives all of us more options and resources for our own teaching. Presenter Bio: Facilitated by active MDEA Executive Member, Kyle Collins. Mr. Collins is currently in the process of transitioning into the IB model. He has led workshops for the MDEA twice before. His own school division provided an opportunity like this session and he found it very beneficial. We hope you do too! Come excited to share your stuff and learn how other educators are building a great Drama education for the students of Manitoba. Session Description: This interactive session with leave you with engaging activities to use in your classroom the very next day. Be amazed at the sense of community established quickly and easily with simple games that encourage camaraderie, openness, inclusiveness and fun. Presenter Bios: Joanne Parker Gibson is hardly retired. She taught for 30 years at Vincent Massey Collegiate (Winnipeg) and built a reputation for excellence with her stage productions.As a performer herself, she is still auditioning and teaching and directing and igniting a love of performance. Come learn some secrets of the biz to make you a smash hit in the classroom! Lunch is included. Discounts will not apply if lunch is not wanted. Unfortunately, no walk-up registration the day of the conference can participate in lunch. Must have and display registration name tag to receive lunch. Gluten and Vegetarian options will be available also. Please indicate either of these dietary preferences on your registration.